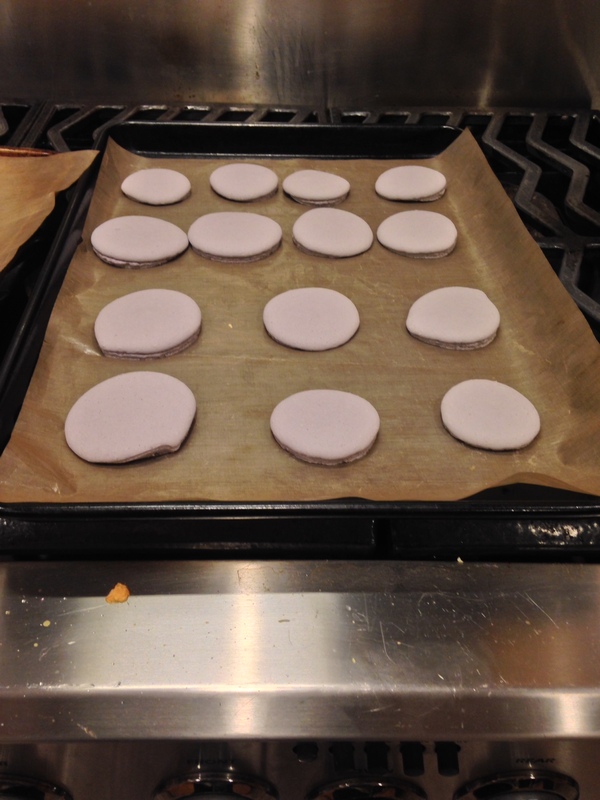 Making vegan Macarons for the first time! 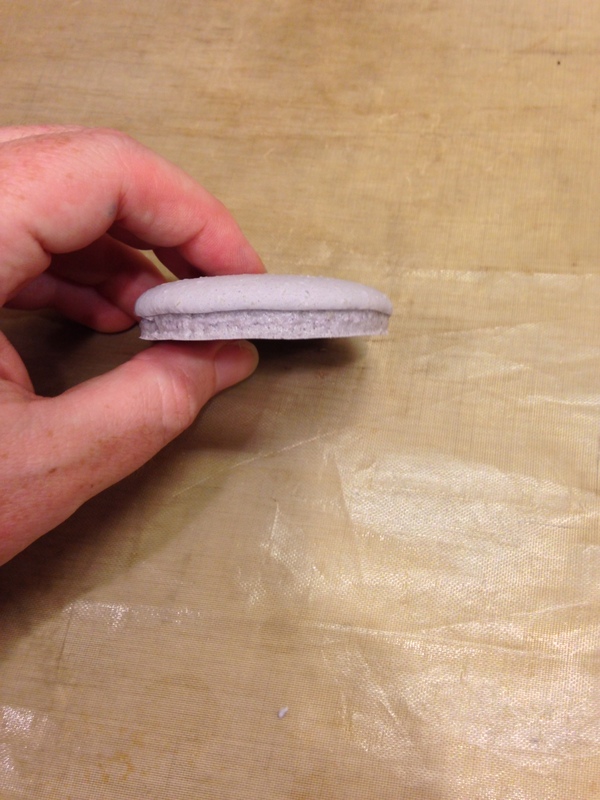 French macarons (not to be confused with coconut macaroons) are a meringue based sandwich cookie with almond flour. They are quite popular and come in all different kinds of flavor combinations. They are supposedly difficult to make even when not vegan. 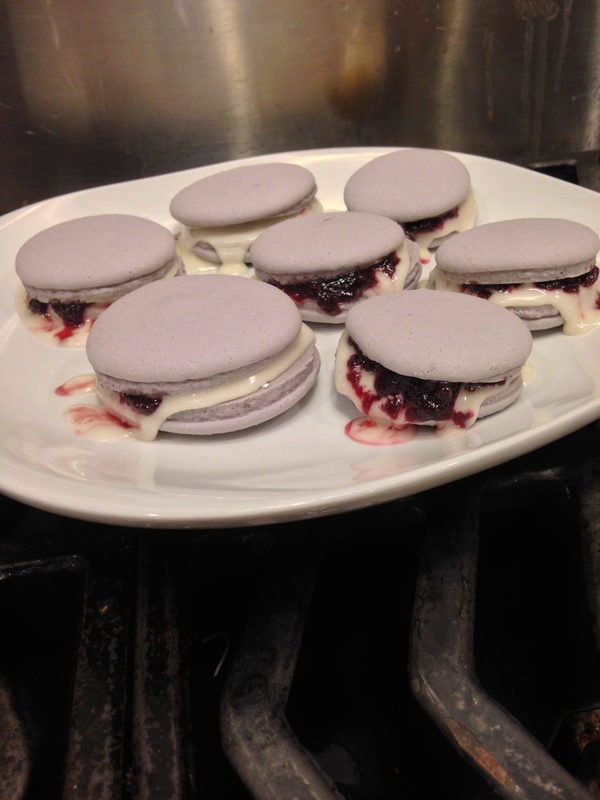 Vegan macarons were once believed to be impossible to make, because there was no good vegan alternative to meringues. But now there is! 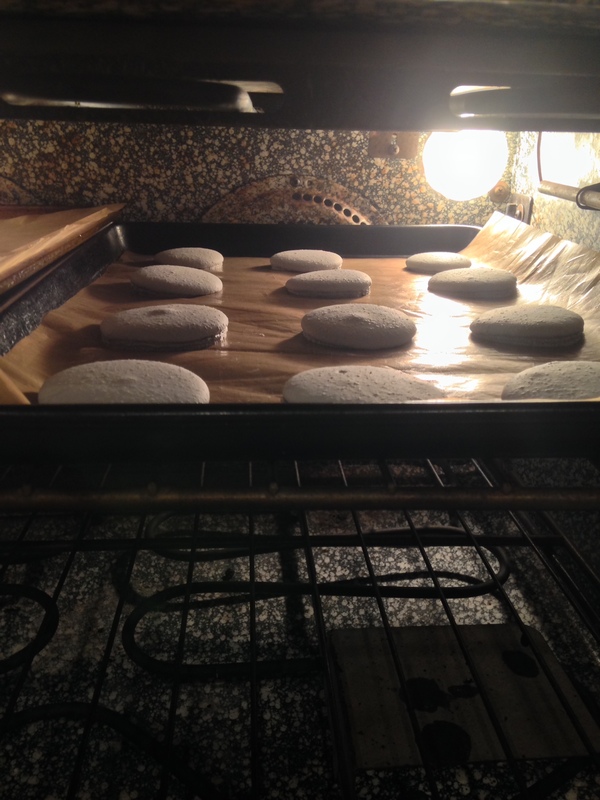 You may recall my post about magical bean juice (also referred to as aquafaba in vegan circles) for making meringue cookies. You can do the same thing with these! I didn’t make up my own recipe since I’ve never made these before, but I still want to share the recipe I used and my results. This is the recipe I used but I changed the flavors, colors, and frosting recipe. It worked perfectly for me, even on my first try. I personally feel like it it might have had a lot to do with the weather, it was a great sunny day. 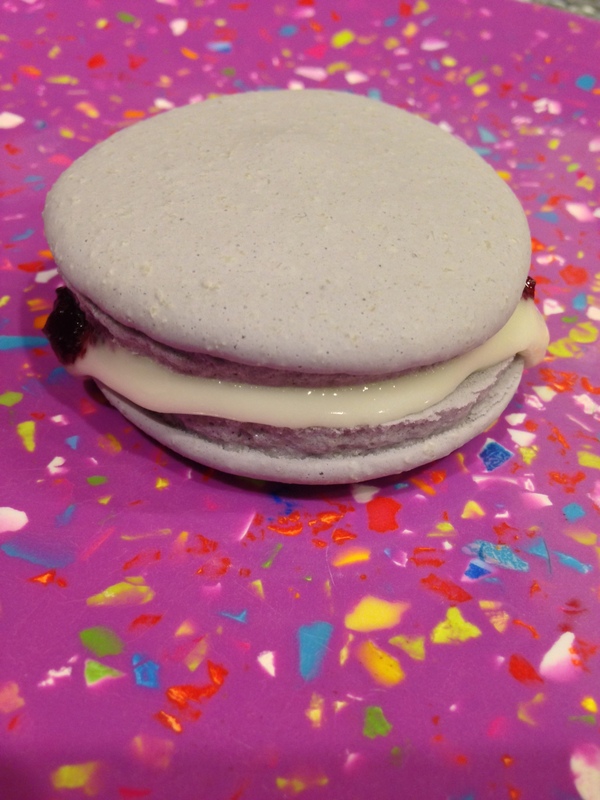 I found this recipe from a group all all about making vegan meringue and using aquafaba. 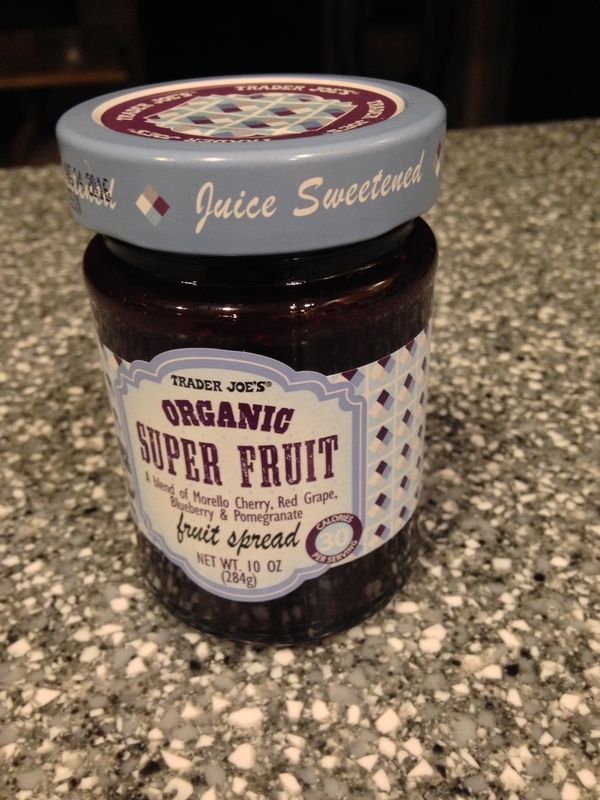 I chose to make lavender agave frosting and used a super fruit jelly in the middle from Trader Joe’s. The texture came out so great. 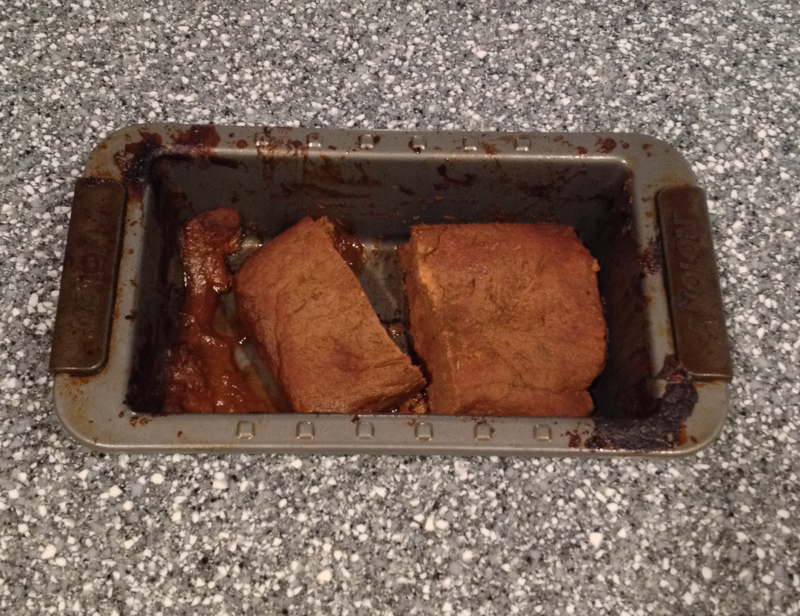 The frosting I made was a little runny, so the recipe I am including here is changed to account for it to be better. You just need to mix everything together. I absolutely loved these, and the best part is they are automatically gluten free! I’m deep in the midst of making food for volunteers at Girls Rock RI this week, stay tuned for a post about that soon! 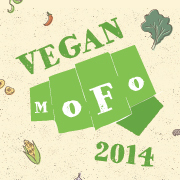 Vegan Mofo 2014: Pizza day! 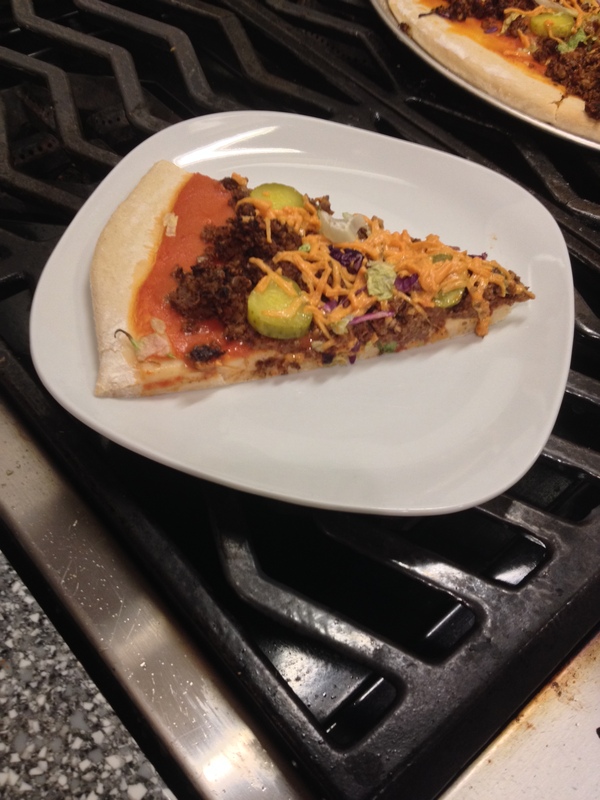 (Day 26) Walnut Meat Cheeseburger Pizza! I think this is one of the prettiest pizzas I’ve ever made. So many colors and it was amazingly tangy, cheesy, crunchy and meaty all in one bite! The crust is the same pretzel crust that I made on this pizza too, because I realized it’s my favorite pizza crust now whether it’s pretzel dough or not. Oh man, I made this awhile ago and now I want it again. My mouth is watering thinking of it, but I am also feeling a bit lazy today, so that’s not going to happen. 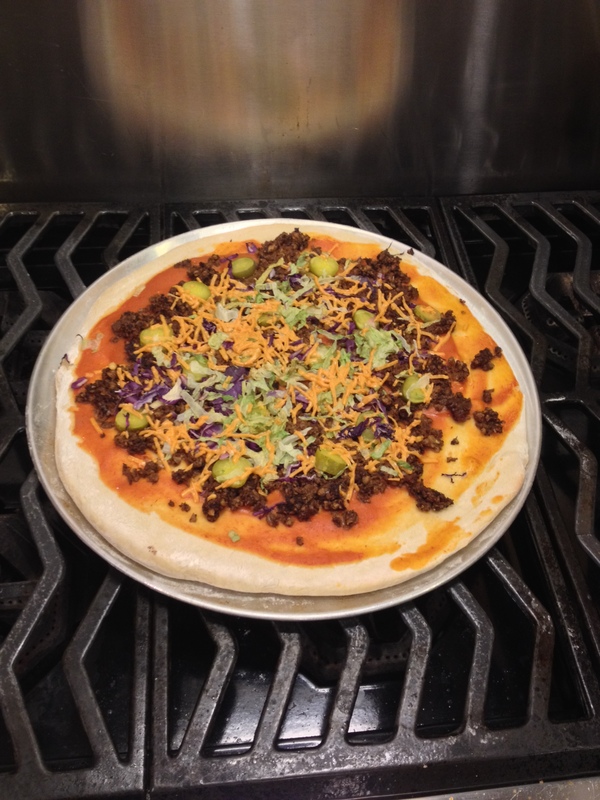 After making the batch of walnut meat, turn the oven up to 450 degrees F.
Roll out the dough into a large circle and place on a pizza pan. Combine the sauce ingredients and spread across the crust. Sprinkle the walnut meat all over. Place pickle circles around the pizza. Sprinkle 1/2 cup daiya cheddar on top, then sprinkle the lettuce and cabbage, and top with another 1/4 cup of daiya. Simple Roasted Chickpeas with Agave Mustard! Before I went vegan I was obsessed with honey mustard. In fact, I used to be a honey mustard fiend. Luckily for me, it’s easy to make a vegan version. I just mix vegenaise, yellow mustard, and agave and it comes out pretty much the same. Today I made some of it to dip a pretzel into…and then I was like “hmmm this would be amazing on chickpeas” so I whipped this recipe up. 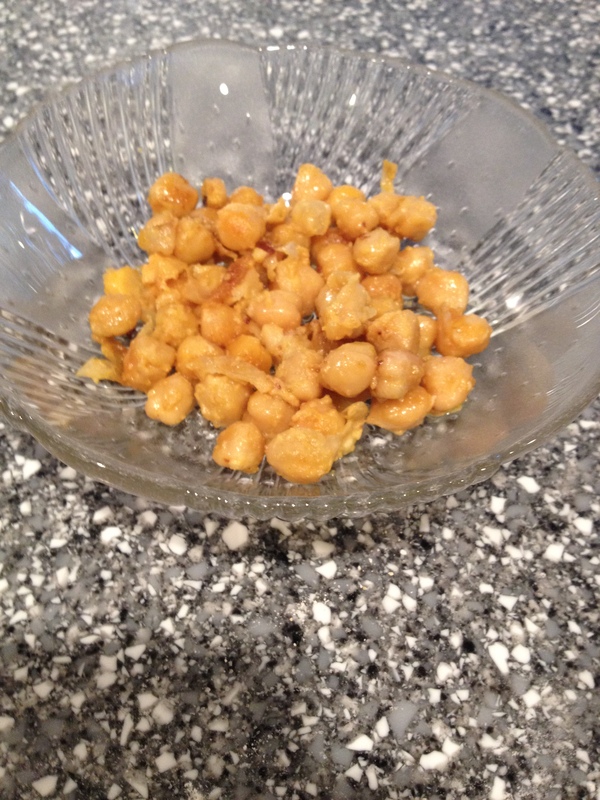 Place chickpeas in a shallow baking dish in a single layer. Mix 2 tbsp vegenaise, 1 tbsp yellow mustard, and 1/2 tbsp agave into a small bowl and stir until combined. Pour over the chickpeas and stir until evenly coated. Place in oven for about 25 minutes. Take out after 25 minutes, stir, and add the other tbsp of yellow mustard and stir again until incorporated. Place back into the oven for another 20 minutes or so. You may want to check after 10 minutes to make sure they’re not burning…but they should not be unless your oven is hotter than mine. Let cool for a few minutes and eat while hot, they’re best right then!